STARKVILLE, Miss. 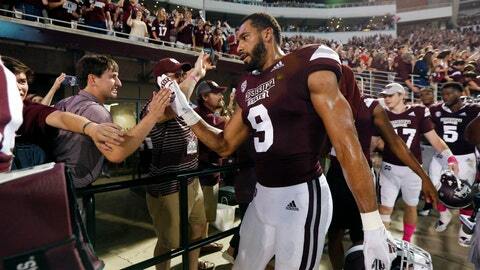 (AP) — Mississippi State has welcomed its current off week as a chance to rest, regroup and tinker with an offense that’s had its ups and downs through the first six games of the season. The defense has no such worries. It just needs to continue to doing what it has been doing. The 24th-ranked Bulldogs (4-2, 1-1 Southeastern Conference) have the nation’s top defense in the country by at least one important measure — scoring defense. Mississippi State is giving up just 12.7 points per game and has surrendered only seven touchdowns over six games. Mississippi State’s defense was at its best in last weekend’s 23-9 victory over then-No. 8 Auburn. The Tigers managed just three field goals. The breakthrough win highlighted what’s made the Bulldogs’ defense so tough this season. Auburn was occasionally able to move the ball in the middle of the field, but when the Tigers got to the red zone, Mississippi State clamped down quickly. Opponents have scored just four touchdowns in 14 red zone trips against the Bulldogs this season. Mississippi State is particularly good along the defensive line, where the combination of senior Montez Sweat and junior Jeffery Simmons has consistently wrecked the opposing team’s offensive game plan. The 6-foot-6, 245-pound Sweat has 10 tackles for a loss this season, including three sacks against Auburn. He’s been the SEC’s defensive lineman of the week five times in his career, which spans just 19 games since transferring from junior college. Sweat has been productive off the edge while the 6-foot-4, 300-pound Simmons is a load to handle on the interior and has 8½ tackles for a loss. When both are playing at the same time, the offensive line has its hands full. Mississippi State coach Joe Moorhead said Sweat’s presence in practice has helped the offense improve. When there are problems on the offensive line, Sweat can exploit them in a hurry. “Sometimes it can be a little bit of a pain because you have a hard time getting a pass off, particularly in spring ball early on, but I think iron sharpens iron,” Moorhead said. Mississippi State’s off week gives it extra time to prepare for a road trip to LSU on Oct. 20. That starts a difficult stretch for the Bulldogs, who will also play Texas A&M and Alabama over the next four weeks. Shoop said while his defense has been very good, it’s far from perfect. Even though the Bulldogs beat Auburn, there were still some breakdowns in coverage. Auburn botched two great opportunities at touchdowns, one on a dropped pass and another on a fumble at the 1-yard line. The Bulldogs might not be as fortunate against LSU, which has already earned wins over Auburn and Miami. Mississippi State will have to prove itself all over again. “I’m quite sure that LSU doesn’t really care about our defensive statistics,” Shoop said.